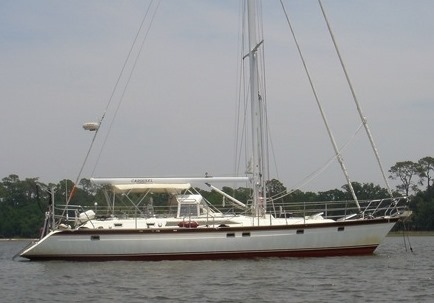 CAROUSEL a 50' Taswell 2000 Price Reduced to $495,000. She is located in Brunswick, GA. The talent and experience of Carousel’s designer, Bill Dixon, are evident in all aspects including her attractive deck styling, exquisite interior joinery, and fast, sea-kindly hull design. There is extra storage in every cabin and especially the galley, all berths are longer and wider, beautiful matched grain varnished teak woodwork throughout and a teak cabin sole with contrasting inlays. The spacious, bright, well ventilated interior offers living space comparable to many larger designs. The patented shoal Scheel keel allows access to thousands of additional harbors and anchorages not usually accessible to a 50’ yacht. A Stoway mainmast, electric winches automated staysail and headsail furling and bow thruster are valued options that facilitate sailing Carousel shorthanded. Fuel and water capacity have been increased with the addition of custom tanks in the salon and second guest cabin. Please call David Walters at 954-328-2130 or office 954-527-0664 for more details.